The segments page displays all the segments you have created in the Analytics page and allows you to activate them to all your channels. You can save your segment in Analytics after setting all the filters you like and press Save Segment on the top right corner of your screen. This will open up a model where you can name your segment and save it. By default, Yieldr will suggest a name with an Origin, Destination, Start date and possible end date of your segment. Of course you can change this name and use your own naming convention. Once you have saved a segment in Analytics it becomes available in the Segments section. In the segment section you can see all your segments and choose to view or edit them. This is also the place where you can export your segments to the specific channel you would like to activate it. Finally, you can also setup your Abandoned Cart campaign here, read more about that here. To view or edit a segment, hit the 3 dotted menu button and click on View/Edit. This will take you back to Analytics and allow to investigate the composition of your segment. If you like to open more segments in order to compare results, you can just open multiple segments in new tabs by using your browser shortcut (often ctrl- or cmd-click). When viewing a segment in Analytics, naturally all your filters will be restored and you will see the name of your segment in the top of the screen. When making changes to your filters and thereby editing your segment you can save those changes. You can just click Save Segment and effectively adjust the original segment. You can also choose to hit Save Segment As.. and save a new segment with your adjusted filters with a brand new name. Most important, in the segment listing you can export your segment to one of your own channels. You can hit the Export button next to the segment name in the menu. This will open up a modal where you can select where you want to export your segment to. The export channels depend on the integrations that have been set up in your account. 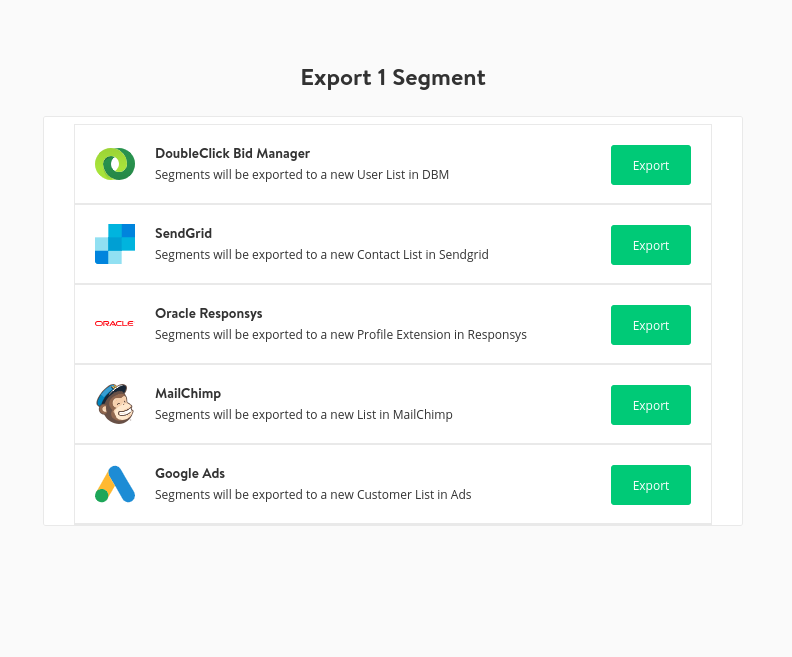 Currently the export channels available are Facebook, Google Doubleclick Bid Manager, Google Adwords, MailChimp, Sendgrid, Oracle Responsys, Emarsys and Yieldr Ads. Note: when editing a segment that is streaming to one of your activation channels, your adjusted filters will apply to all new travelers. Your adjusted filters will not remove travelers that were already exported to you activation channel. For example, you might be streaming all travelers that are interested in route A and B to Facebook through Segment “Facebook top routes” and you might have been doing so for two weeks. If you edit your segment and change the routes to A and C and keep the name “Facebook top routes” - all travelers interested in route A and C will be streamed to Facebook from the moment you save your adjustment. Travelers interested in route B that have been exported to Facebook in the past two weeks will still be part of the Custom Audience in Facebook and will not be removed. If you prefer to just target travelers interested in route A and C, save the segment with a new name and export the new segment to Facebook. If you have any platforms you would like to connect with, please contact your Customer Success Manager. If you experience any hiccups while exporting your segments, please check this article.